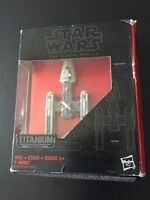 New Star Wars Black Series Titanium #8 Y-Wing. Ready to ship! iheartk-77 has no other items for sale. Star Wars Black Series Titanium Series #12 Poe's X Wing Fighter New!